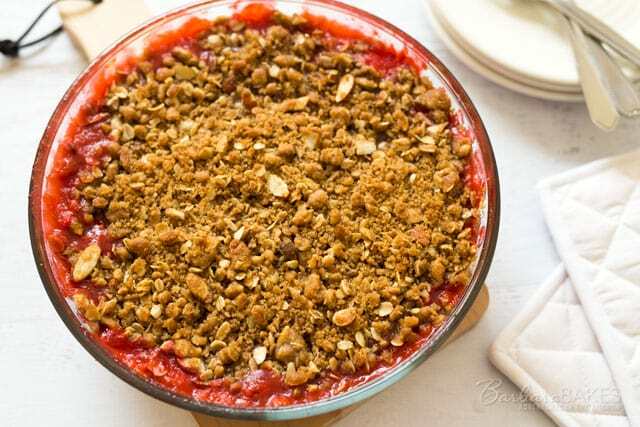 Tart rhubarb combined with sweet, ripe strawberries topped with a crisp oat and almond crumb topping, served piping hot with a scoop of vanilla bean ice cream. It’s rhubarb season and recently when I was visiting my mother-in-law she asked if I’d like some rhubarb from her garden. I had some strawberries at home in the fridge, so I gratefully accepted, and hurried home and whipped up this Strawberry Rhubarb Crisp. I like to pre-cook and thicken the rhubarb in the microwave before adding the strawberries, so the Strawberry Rhubarb Crisp cooks very quickly and the strawberries stay a little more firm. Serving crisp with a scoop of vanilla ice cream is a must at my house. I love creating the perfect bite with a little bit of the piping hot, tart fruit, some of the crisp topping, and some smooth, creamy ice cream in every spoonful. You can bake the Strawberry Rhubarb Crisp in one large baking dish, or it’s also fun to make individual servings for everyone. Just be sure and bake the crisp on a baking sheet to catch any of the fruit that may bubble over the edges. Preheat oven to 375º. Spray an 9x9 baking dish with non-stick cooking spray. Mix sugar, cornstarch, and salt in large microwave-safe bowl. Mix in water and rhubarb. Microwave on high, stirring occasionally, for about six minutes or until the rhubarb is tender and liquid has thickened. Stir in strawberries, zest, and food coloring if using. Spread in the prepared dish. In a large bowl combine brown sugar, flour, oats, almonds, 1/2 teaspoon cinnamon and 1/4 teaspoon salt. Add melted butter and mix with a fork or your hands until mixture resembles crumbly wet sand. Sprinkle mixture evenly on top of strawberry rhubarb filling. Place baking dish on a rimmed baking sheet, and bake until filling is bubbling around the edges, and topping is golden brown about 25 minutes. Cover top with foil if the top is getting brown before the filling is bubbling. Let rest 20 minutes before serving. Serve warm from the oven topped with a scoop of vanilla ice cream, if desired. Rhubarb is something that all of us should try to make. Especially this one! Wish I will have the chance to try the rhubarb someday ! Yours looks great. 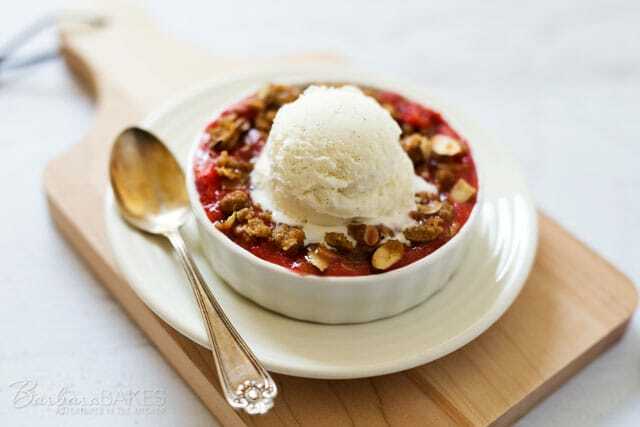 You know, I’ve never cooked with Rhubarb but this strawberry Rhubarb crisp is making me want to! I made my first rhubarb dessert of the season last week! I’d love to make a crisp next—so yummy! This has to be one of the prettiest desserts I have ever seen Barbara. 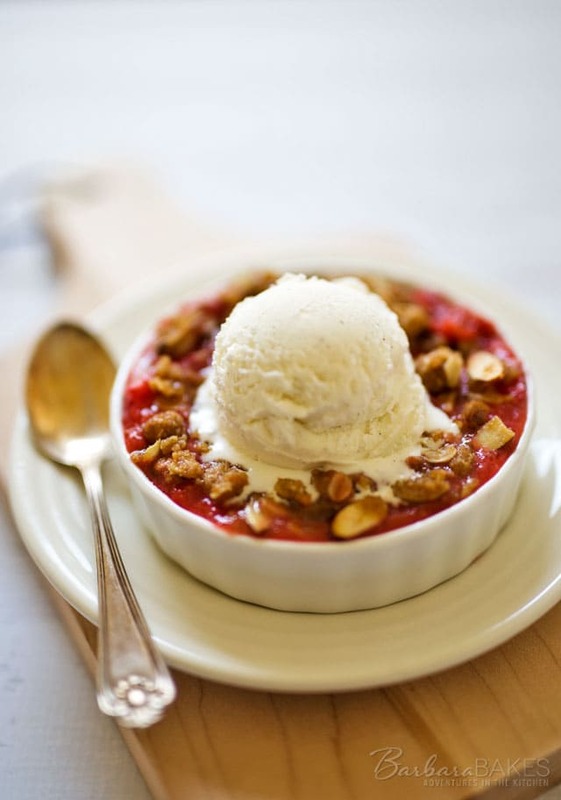 I love a good fruit crisp and with that vanilla bean ice cream on top – swoon! I just love strawberry and rhubarb combination! So delicious with ice cream! If my dad were still alive, he would eat his, yours and mine all in one sitting. This was his favorite combination and I’ll make it in his honor for Memorial Day. Yum!!! I have access to some garden rhubarb too! I love everything about this crisp!